Top Guard Floor Finish Enhancement therapy is an amazing professional floor protection product recommended for all high traffic retail and commercial environments. Ask about Top Guard PRO! Our New Fragrance Free Formula! Wet Mop - Cotton and Nylon will both work well - Microfiber works great! Ultra high speed floor machine - 1500 rpm minimum. Higher rpm = Better Shine. Floor pads: Select from any of the light-medium aggressive Natural Blend Hair pads. Our Wonderbuff pad also works great. Damp Mopping - Fill Mop bucket with 1 gallon of cold water. (If unsure of amount, use an empty gallon container to help measure.) - Squeeze Top Guard bottle to fill the chamber with two (2) ounces of Top Guard and pour into bucket. 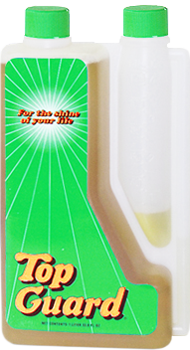 Spray Bottle - Squeeze Top Guard bottle to fill the chamber with one (1) ounce of Top Guard and pour into spray bottle. Fill spray bottle to top with cold water. Damp Mopping: Wring out the mop well. Top Guard should be applied to the floor a bit thinner than a coat of floor finish. Spray Bottle: Slowly swing your arm from side to side spraying Top Guard from the bottle in a stream (not a spray). Do not worry about applying Top Guard evenly, the floor pad will spread the solution evenly over the floor when burnishing. Top Guard can be burnished Wet or Dry! When Damp Mopped, allow approximately 1 minute for Top Guard to begin to dry and burnish while still damp for best results. When applied via spray bottle, begin burnishing immediately after Top Guard has been applied to the floor. *Take your time when burnishing for the first few times for a stronger, deeper shine. Make a date to come back and evaluate your new Top Guard floor after the day's traffic - compare the Top Guard results to your usual method with your existing product. The difference is Top Guard! Top Guard enhances the slip coefficient of the floor. Walk on the floor while it is wet and take note of how non-slip the floor appears. When dry, test the slip resistance of the floor... Incredible. Make special note of the gloss. It's deep and water clear, not hazy like polymer based restorers. 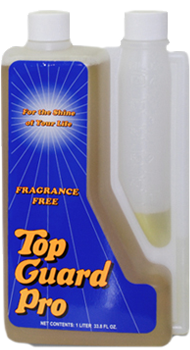 Top Guard is the only Finish Enhancement product that eliminates the dust created from burnishing (even with propane). Remember to look at the bottom of the floor pad... There's no white ring, no build-up. The finish that's on the floor stays on the floor! Try Top Guard on wood or brick. Top Guard has the unique ability to remove the haze that forms on these surfaces. Dilute Top Guard at 3-4 ounces to a gallon. Use this Top Guard Dilution as a heavy duty scrubbing solution. Apply to the floor, allow ample dwell time. Scrub the floor with a Blue or Green cleaning/scrubbing pad to remove the top layer of finish or simply repair a badly worn floor. After scrubbing, remove solution, rinse with plain cold water and either apply a new coat of finish or apply Top Guard and burnish. Follow the instructions on the previous page. We hope you enjoy using Top Guard.